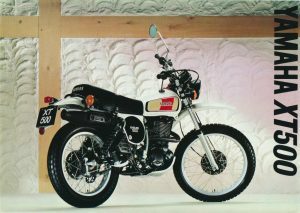 The next in our series where Classic-Motorbikes.net looks back at the machines enjoyed by those of us now in our 50s. What made them memorable and why we loathed or lusted after them? 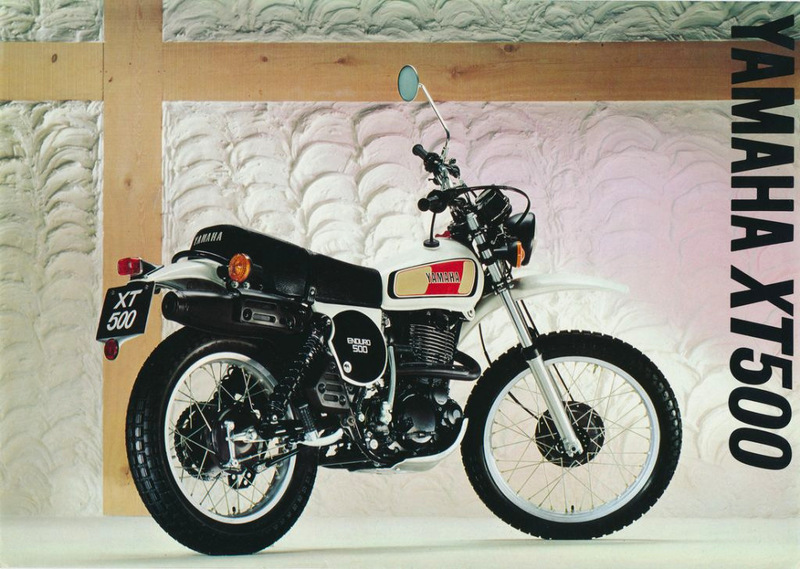 Although the XT500 was first introduced at the American Yamaha Dealer Convention in 1975, it didn’t hit our shores until the long hot summer of 76. Not ideal, trying to kick start the ‘Thumper’ during the hottest summer on record, although it deterred potential purchasers ‘not a jot’. Apart from the relentless heat, we endured months of Elton John & Kiki Dee not ‘breaking each other’s hearts’ whilst top of the ratings for TV watchers was The Bionic Woman…now she could kick start a dumper truck! 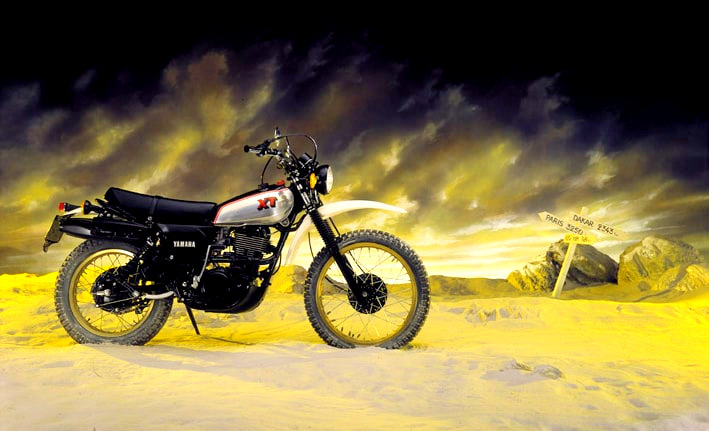 The XT is one of those bikes you desired in-period and 40 years on? Well, who wouldn’t want to open their garage doors and admire a bike that just hasn’t aged, unlike the pilots. Its popularity is something of a mystery, let’s be honest, the frame wasn’t revolutionary, neither were the twin shocks or drum brakes. That big single did though mark new territory for Japanese manufacturers and the XT could multi-task, not a bike to be pigeon-holed. On or off road, cruise or scratch the XT was good at everything and it returned 50mpg from 30bhp, didn’t go wrong and could be maintained on the kitchen table. As most will remember, the era was dominated by multi cylinder machines which pleased many (me included) but not all, especially in Blighty. Flat-capped chaps still looked back often with their ‘rose tinted bifocals’ at the good old British singles, the Japanese certainly considered this market available. Throwing your leg over the previous decades Europeans always offered a thrilling concert of engine note; provided it would start. 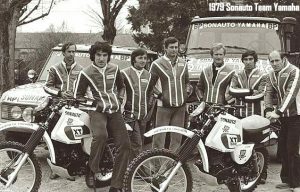 Poor electrics, blown head gaskets and oil leaks were the norm and Yamaha looked to cash in on those short falls; the place to prove their potential was in the toughest of all competitions. 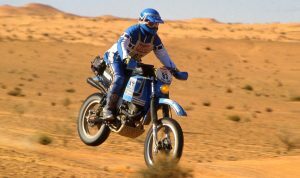 Nowadays, the term Rally-Raider covers the off-road style of which the XT was the originator but it wasn’t the first Yamaha to be successful in North Africa. 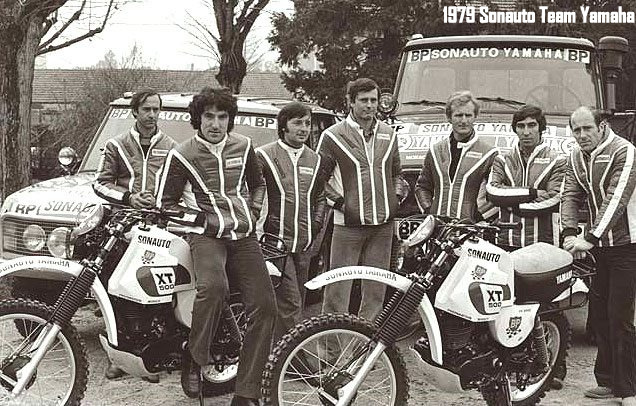 The Cote-Cote (coast-coast) raid from 1975-76 took the competitors from Abidjan on the Ivory Coast some 4k miles to Nice and ‘Sonauto’ – Team Yamaha entered four DT400’s, one of which ridden by Gilles Comte came 2nd overall to a Honda XL250. Returning to Abidjan Christmas 1976 the Yamaha backed squad took four official modified XT’s alongside two of their DT 400’s. The XT of Gilles Comte not only took the bike class but also 2nd overall, whilst the final classification for motorcycles saw ten of 16 XT’s finishing well plus a DT400 still impressing with second place in class. 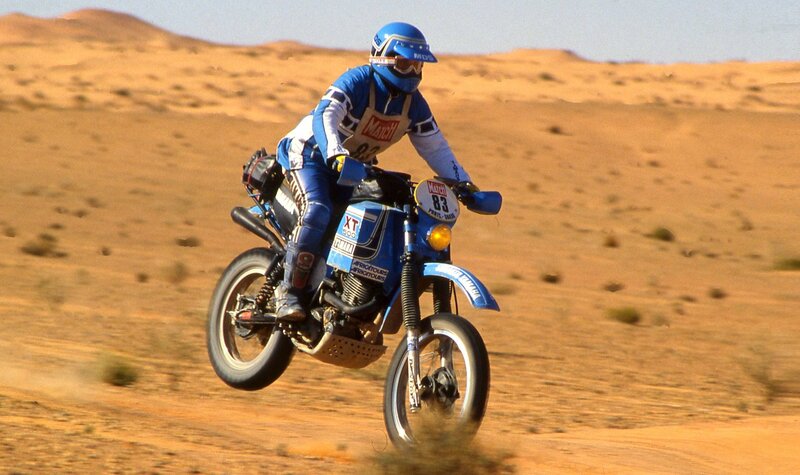 The privateers had already realised the machine of the moment and near future was the XT. 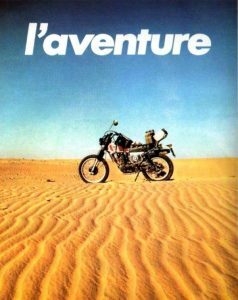 One man, part of this event was Thierry Sabine, he became lost in the Libyan Desert for three days, on his return to France he planned the Rally Raid that dominated the scene from then on; the Paris-Dakar. On Boxing Day 1978 some 170 race machines departed of which 90 were on two wheels, 38 on Yamaha’s XT. 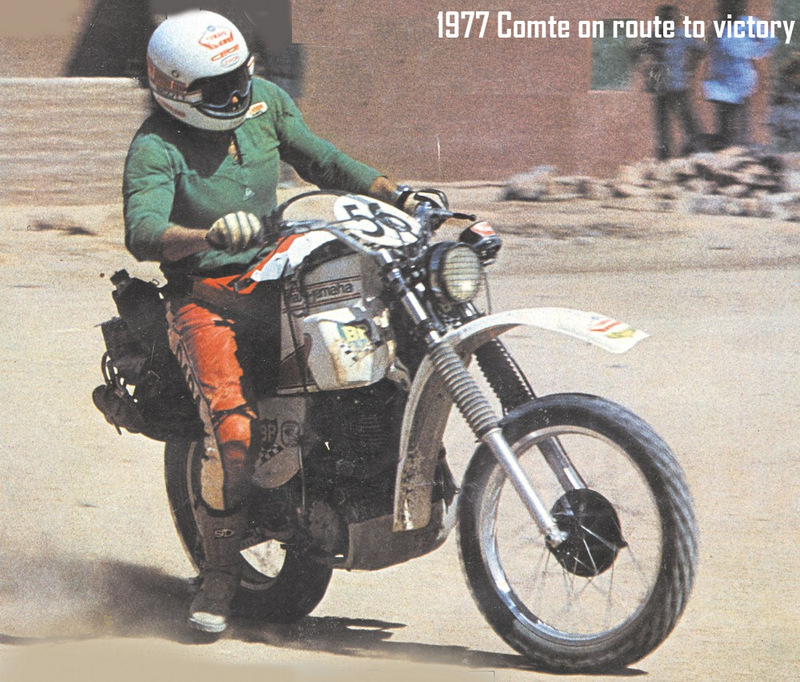 Only 34 crossed the finish line on the beach at Dakar and the XT provided 14 including the winner and the runner-up of the first Dakar Rally: France’s Cyril Neveu and Gilles Comte. 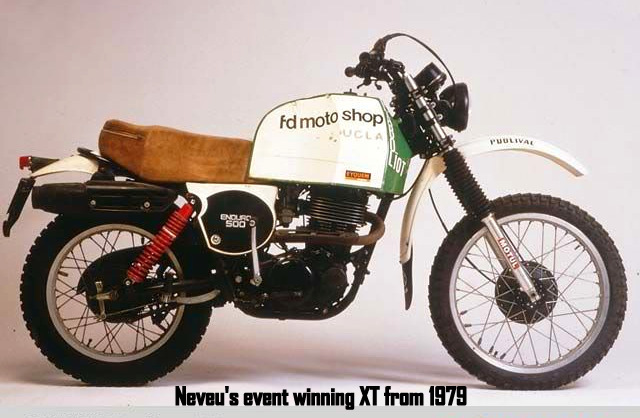 The following year Neveu returned and won again, the XT and Yamaha filled the first four places. 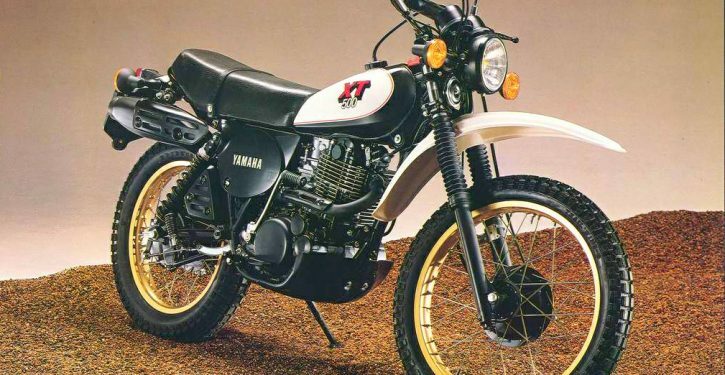 Yamaha had their fully off-road version under the title TT500 in American dealerships in 1976 just one month after the versatile XT. 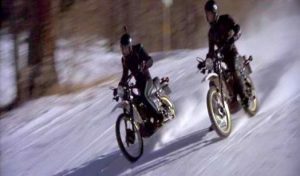 They shared the same chassis and engine but the TT was far more inclined to the dirt bike rider with a larger Mikuni carb 38’’ as opposed to the XT’s 32’’. Smaller front brake drum and alloy tank (XT from 79) no instruments, battery or lighting but with the option of a headlight from the TY250. There is little doubt both the TT and XT were primarily aimed at the American market but on the back of their success Yamaha’s Atsushi Ishiyama looked to the European arena for his reworked SR 500; the ‘road only’ sibling that appeared in 1978. The XT world share the SR carb with an accelerator pump from 78 offering a couple of BHP extra. The SR model ran until 81 ‘Stateside’ and a couple of years longer for Europe; versions across Asia were still in dealers two decades after launch. The XT basically enjoyed its original format until the early 80s, engine upgrades made the Yamaha slightly more efficient but never far from its early spec. In Japan, Yamaha had initially struggled to get the XT right, mainly trying to solve engine issues. 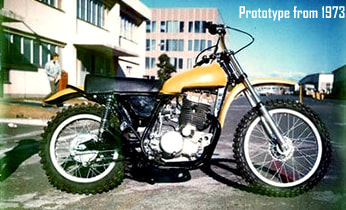 The target was a simple, durable and flexible single but at the time it was just the 2nd four-stroke totally designed by the factory. 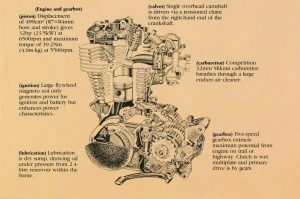 Variants included DOHC and oil cooling for the cylinder head which proved too complicated and the man responsible for the power plant Shiro Nakamura confessed… First, the heavy pistons gave us countless problems. They seized up and were punched. Cylinder and head development was as difficult. We even had a cylinder that broke in the middle. At that time, we didn’t even try balancer systems, although we had many problems with broken crankshaft bearings as well. The con-rod had no big end bearing but was turning on a needle bearing that needed a low-pressure lubrication. We did make this choice instead of using a one-piece forged crankshaft with assembled connecting rod because it allowed us to build a much more compact engine and was also cheaper to produce due to its vertically split crankcase. In the end all our technical problems delayed the roll out by more than one year. But we had succeeded, XT was now more reliable than a big single 4-stroke had ever been! Although, it was over-square with a bore and stroke of 87 x 84 mm we obtained the real character of a big thumper. The two-valve head gave a flat torque curve while the smaller flywheel allowed the engine to rev up as easily as we wanted. Dry sump and short stroke also allowed for better ground clearance and a more compact engine’’. 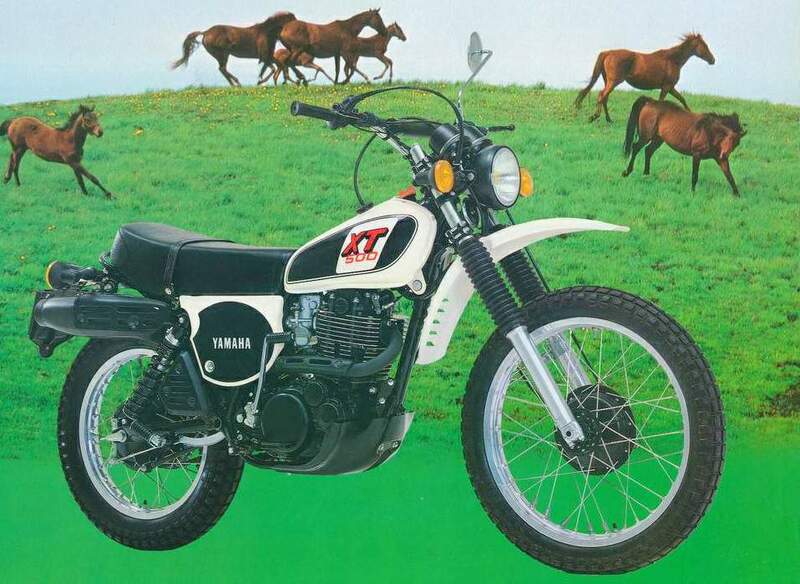 Whilst you wouldn’t expect Yamaha to say bad things about their all new machine in the mid-70s, their brochure tended to stick to the facts. 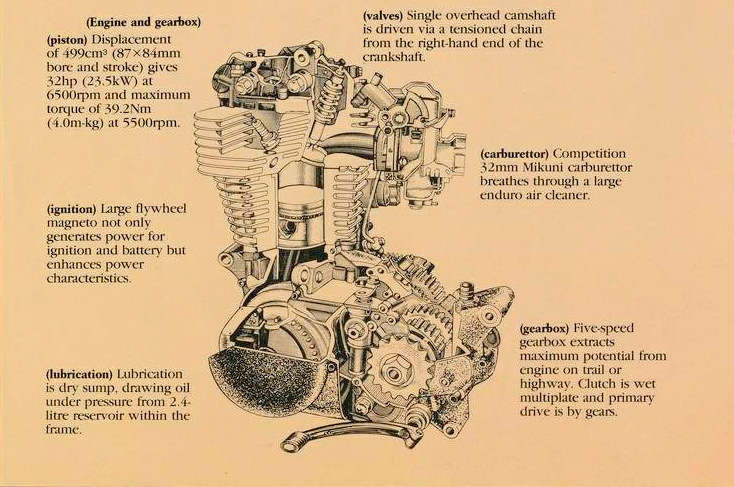 Their four-stroke single did develop smooth power over a wide range and produced ample torque from low revs. The transmission was versatile and was easy to operate with its short throw lever, whilst the long travel heavy duty forks did soak up the worst of terrain. The frame was light (for the time) and strong whilst offering a low centre of gravity for improved balance and handling. The frame also holds the oil reservoir within the large diameter top tube, eliminating the need for a huge wet sump; the base of the ‘Thumper’ received a large alloy bash plate for protection in late ‘77’. Cycle Guide in America got their hands on the first purely off-road TT versions in 1975 and concluded the bike offered an easy to start, unadulterated 500cc thumper fitted with modern suspension and 5 speed transmission. 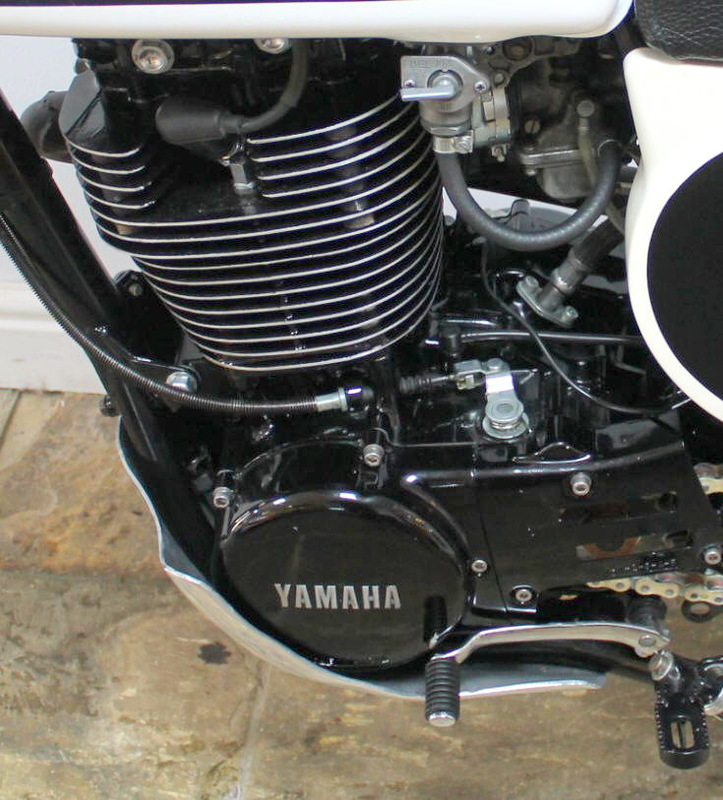 Easy to service with traditional Yamaha styling and a ‘whole cylinder of fun’. The only criticism was no reserve on the fuel tap and if riders wanted a speedo a new DT400 wheel was required…they also revealed one of their testers was so impressed his first stop post-test was the local Yamaha dealer. The XT reviews stand out from other machines, riders exclaim their delight with some unusual quotes, whilst all can’t fail to admit delight perched aboard the Yamaha. 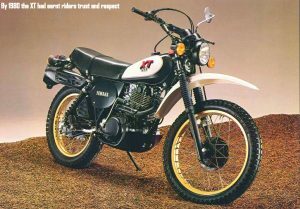 Phrases such as ‘stomping’ were common place and Cycle Magazine claimed in 1976 ‘Yamaha’s XT is the best dual-purpose street machine available’ it was at the time and remained so for years. 70s tearaway Gary James, bike shop worker in-period, either owned, borrowed or blagged all of the era’s two wheelers…He always shares an opinion, whether we like it or not! He thinks…Brilliant on, but better off road. Took some controlling and could be tough to start. 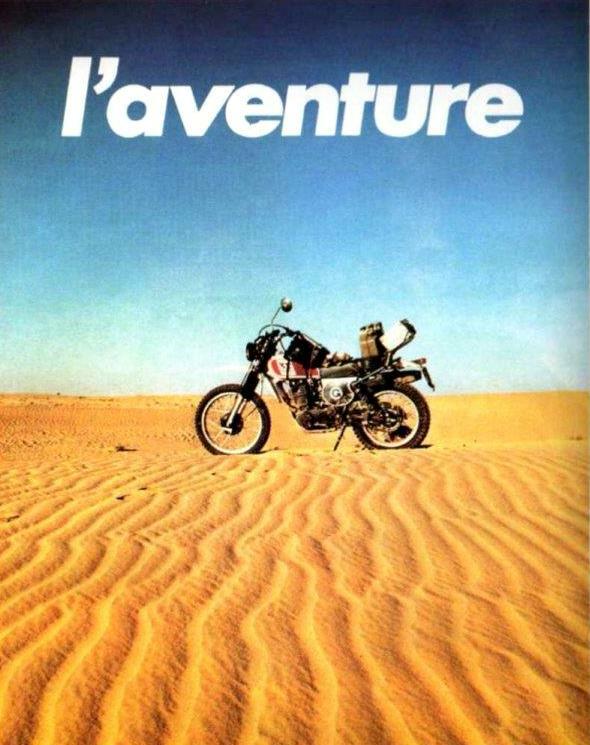 Born pre Paris-Dakar and way before all adverts included sand dunes or the phrase adventure sport had been uttered. The XT is slightly unique as it didn’t just become the ‘old model’. Small upgrades every now and then certainly, but essentially what sat on the dealer’s forecourt in 76 remained around through the 80s. Many consider the XT500C to be closest to original desert racing spec but although the final letter would update, the bike itself altered little. In 1977 it received the ‘D’ as its model year then in 78 the ‘E’ obviously followed when Stateside buyers received the alloy tank and black fork gators whilst Europeans enjoyed the red/white tank, bash plate and gators. No changes were offered until the final model the ‘H’ in 1981, even then they were minor with alteration to the rear mudguard and new design of headlight. The XT600 and the long-distance option of the Tenere arrived in 1982 and many considered it would spell the end for its older sibling but the three models ran alongside each other; plus, a short two-year run for the 550 version which ended in 1984. Let’s not forget the XT350 that sold from 85-98, all would have taken sales from the ‘old faithful’ The XT500 would out last all but the 350cc and Tenere version which morphed into various options under the XTZ range; the final chassis of the enduring XT500 would leave Japan in 1989. Not just a legacy but a new way of motorcycling, one where top speed wasn’t an important factor. The XT500 would never win you a hand in the ‘top trumps’ world of motorcycle stats but it won many hearts and is considered one of the best ‘singles’ ever. It brought the world of enduro and rally raids to the guy in the street and in 1981 enjoyed a starring role in a Bond film. Even today great ‘You Tube’ footage of the XT’s in action are still being added; mainly on how to start one without breaking your ankle! The XT500 managed to take things back to basics but then offered a long, reliable and fun future with its owner; no doubt many of which will be wishing they had never parted company. Bond ‘For Yours Eyes Only’ XT chase.